Looking for the latest deal in town? Come and grab this best deal for you and your family. 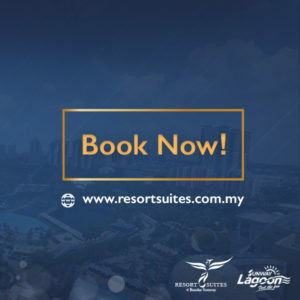 Resort Suites at Bandar Sunway is celebrating its first year anniversary and in conjunction with our anniversary, we are offering Room Stay + Sunway Lagoon Tickets package from only RM 449. You will get one night stay at Resort Suites Bandar Sunway and Two (2) adult theme park tickets. Note: Packages is only available for booking more than 5 days in advance. Example, stay on the 15th must book on or before 10th. For further clarification, please call +603 76117679 or +60175007679 or via our web contact form. Book Direct Now, Best Price Guaranteed!